The stripped down Porter Mogul with new cylinders, motor/gearbox and drivers. Now that the Christmas season is behind us, I can finally get back to some serious modeling. Santa was good to me this year giving me some needed tools for the shop and some interesting reading material. Before Christmas, I had decided to start building the town of Milton but had to wait until some of the windows and styrene were ordered. 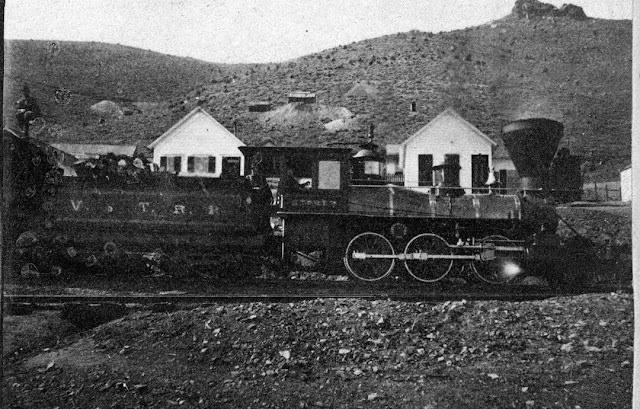 While I was waiting, I started some research on early Virginia & Truckee RR locomotives. 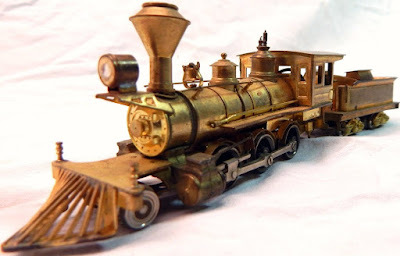 Without going into great detail (you can get detail at www.virginiaandtruckee.com), the first three engines came from Union Iron Works, a small foundry and machine shop in San Francisco. I also discovered that engine 3 had been featured in a centerfold in an 1871 issue of Engineering magazine published in London. A trip to the nearby Linda Hall library led to finding that issue and getting a copy of the article which included a full-scale drawing with dimension. With that in hand and three photos of the engine, I decided to try to convert an engine to Number 3, the Storey. as the Storey but several features had to be redone or replaced. A few dimension checks showed me that the Ken Kidder Porter Mogul was very close to the right size for the Storey. I had one the moguls on my shelf so I checked what would have to be done to convert it. The boiler was the right size but the domes were not. A couple of Precision Scale domes solved that problem. A Cal-Scale 1860s smokestack and bell solved those problems. The cab looked pretty good but had a curved roof rather than one with a ridge. I decided to live with feature rather than rebuild the entire cab. The frame was a bit more work. The drivers were the wrong size (40") and had the wrong spacing. I had the correct size drivers (48") and could easily move the driver slot so it would be closer to the prototype spacing. Replacing the old open-frame motor with a Northwest Short Line gearbox and Sagami motor was next. The Ken Kidder cylinder set was also replaced with a spare MEW set I had along with the crossheads and main rod. Some careful machine work produced a pair of new siderods. While I was at it, I fabricated new fenders for the rear drivers and added a crosshead water pump. I have a spare PFM Reno tender that I will use. The prototype Storey as seen on the V&T. 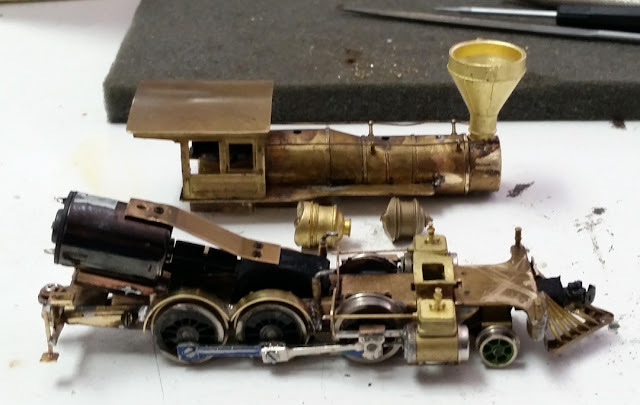 There's still a lot of work to be done to finish the locomotive but it seems to be going along well. When done, it won't be able to pull a great deal but neither could the prototype. There will be more to come later as construction continues.